I spent this morning sewing a healing heart for a lady in my local patchwork group. The request was purple on cream. I decided to go with a machine embroidered idea, but was a little disappointed in how much my fabric pulled in despite very tightly hooping it. I always have that problem, must be the way I sew. For those of you who don't know what healing hearts are, when a friend becomes seriously ill, everyone makes a heart, and we join them all together to make a quilt to give them, to show how much we care, and it is really uplifting for the recipient, too. You've gone to a lot of trouble with your heart Bernadine. I'm not sure if this type of thing is done elsewhere, have only seen healing hearts in Oz and NZ. 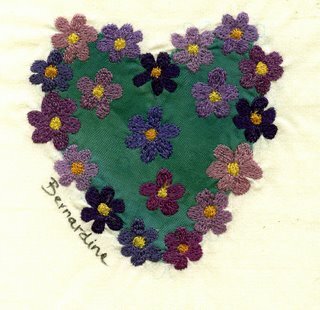 I am sure your friend will be very chuffed with the heart Berni, I know I would be, I am sure her spirits wil be lifted.